In the continued effort to expand my brewing universe, a Scottish ale seems in order. AHA recently posted a recipe for Bonnie Prince Charlie’s 80/- Shilling, an award-winning brew for a style that I’ve not made previously. I’m greatly intrigued by its simplicity–only two malts and one hop! The technique and flavor combinations promise to be something tasty for the winter season, too. I made only a few small modifications, for hops availability (I’ve got a bunch in my freezer, so it didn’t seem right to buy more) as well as for batch size (scaling down from 12 gallons to 5 gallons). Four days in advance, I prepared a 1.5 L starter use extra light DME and yeast nutrients. After 2 days on the stir plate, I cold-crashed the starter in order to settle the yeast. I mashed in the grains with 4 gallons of water at 169°. 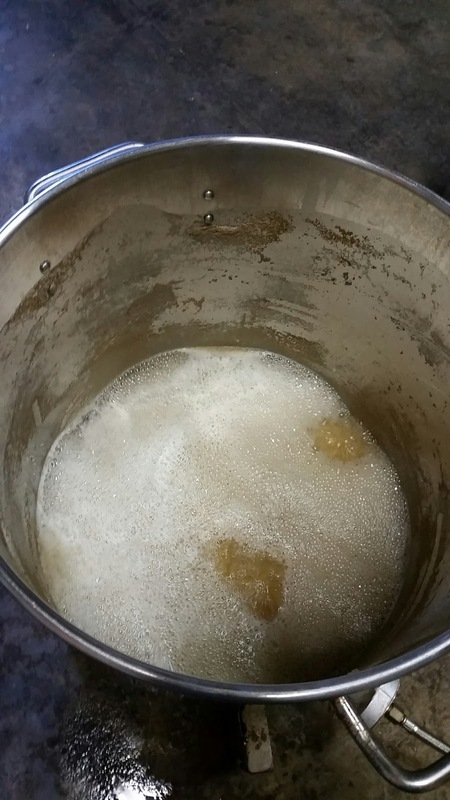 This resulted in a mash temperature of 157°, which was down to 154.6° after 30 minutes. Next, I vorlaufed and collected 2.2 gallons of wort. I brought this to a hard boil for 30 minutes (pictured at right), which brought the wort down to 1.6 gallons. I added the barley to the mash tun and then added 5.25 gallons of water at 175°. I let this sit for 10 minutes, vorlaufed, and then drained the mash tun into the kettle until I had a total of 6.4 gallons of wort. With the two rounds of wort and a total of 6.4 gallons, this worked out to around 74% efficiency. I started the boil and added the hops. Because my hops bags were all in use for dry-hopping and because I didn’t want to get out the hop spider, I just tossed the pellets into the pot directly. I boiled for a total of 60 minutes. With eight minutes remaining, I added a Whirlfloc pellet. I chilled the wort down to 76° using my cooling coil and transferred the wort to the fermenter. This was the point where I realized the lack of hops bag was a mistake; hops matter clogged my screen pretty quickly, so I decided to just dump the wort into the fermenter directly. Lesson learned! The starting gravity was 1.053, with around 6 gallons in the fermenter. I plan to start fermentation at 67°. Although the original recipe suggested 62°, White Labs results indicated that the lower temperature could potentially tend to stall out with their strain. This batch was brewed on November 14, 2015. I plan to ferment for around two weeks before kegging. This entry was posted in 80 shilling ale, Scottish Ale and tagged 80SA. Bookmark the permalink.